Barron Heating’s Wes Diskin sets up a blower-door test as part of the Home Performance Assessment. When my husband and I moved into our Bellingham home two years ago, we were excited to have radiant-floor heating throughout; a Fairhaven rental we lived in many years ago had the same and created almost no dust. Our 10-year-old son has mild asthma, seemingly affected by the dust tossed around in our previous homes with forced-air heating. But to my consternation, our new home still gets just as dusty as our last place—perhaps even more so. 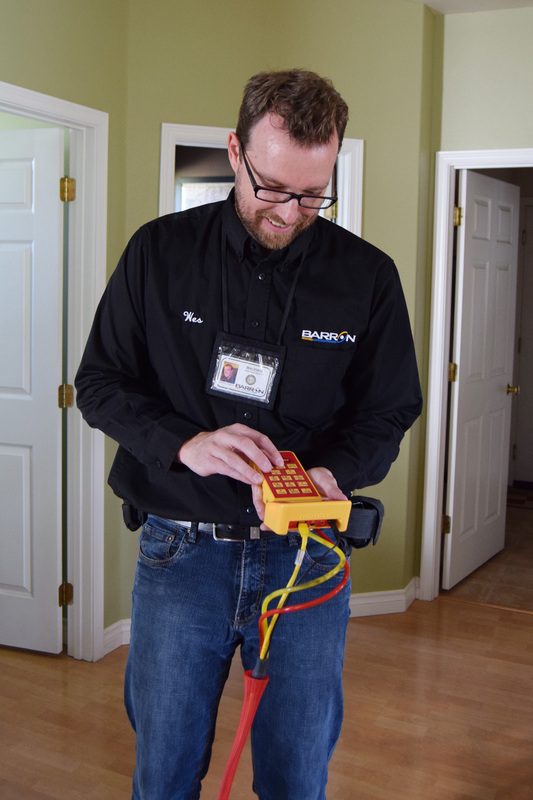 Wes Diskin with Barron Heating arrived early one recent morning to put my house through the home performance ringer—testing it to see how healthy it is and the ways Barron can optimize our indoor air quality. I had been thinking—naively, it turns out—that radiant heating would certainly mean less dust. Not true. Every home is different and numerous factors can cause excessive dust, poor indoor air quality, and health issues. Wes was here to uncover my otherwise fantastic home’s potential airflow flaws. “I fix homes for a living,” Wes says, standing in my kitchen, glancing around. 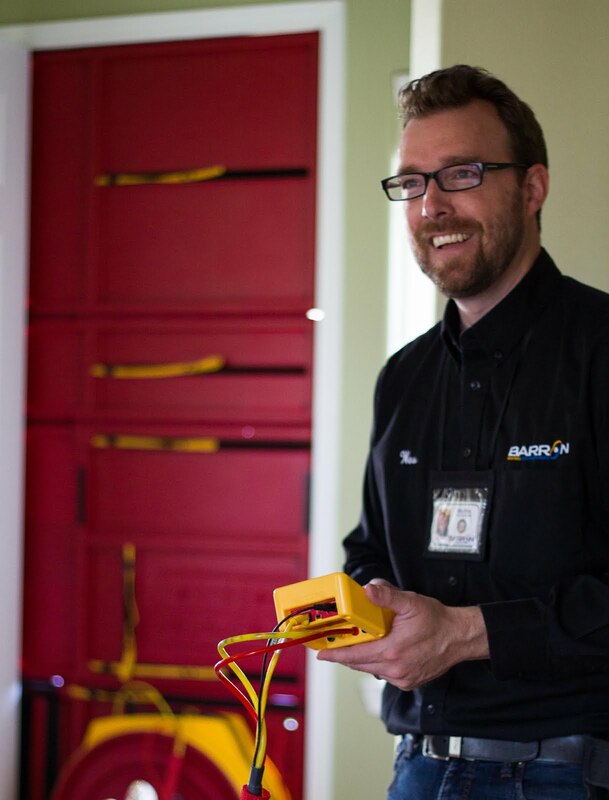 He’s been with Barron Heating for eight years and underwent extensive Home Performance training three years ago that changed everything about the company’s approach. Wes has seen it all. He describes a situation where people living in a home similar to mine—newer construction, seemingly spotless and clean—lived with skin rashes for years, caused by allergies to insulation. He runs his finger along the top of the pantry doorway and shows me the resulting dust—well, what I believe to be dust. But Wes knows better. Wes has been with Barron Heating for 10 years — and conducting Home Performance Assessments for three years. I wince, and Wes assures me this is common. What varies is the levels of insulation and how irritating it is to individuals. Wes explains in layman’s terms the science behind airflow in a house. As that air moves through a house, it carries with it stuff—such as dust and insulation particles—pulled in through openings throughout the house (electrical outlet boxes, can lights, etc.). Wes sets up a blower-door test, which pressurizes the house so he can measure air leakage to the attic and outside. Once everything is set, Wes makes his way methodically through my house, holding a smoke puffer machine, which shows him moving air. 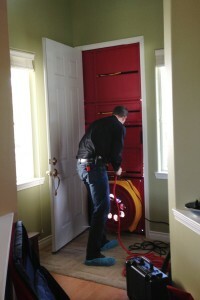 Every 20 minutes that the blower door runs provides 24 hours of air turnover data. Some rooms, like our main floor powder room, elicit almost no movement in the smoke. Many other rooms show a steady flow of air. We head down to the basement. We travel slowly through the house, eventually ending up on the second-floor landing. So: Seal the leaks and solve the problem? Nope. 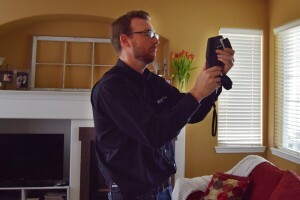 An infrared machine exposes what Wes calls “the invisibles,” or any major things that might be going on in the walls of a home. Wes then walks me through the house again, pointing an infrared reader at all the walls. Because it’s warmer weather, we see white spots where heat is coming in—through the can lights, some of the outlets, the smoke detectors, areas of wall where there isn’t insulation. In the winter, these same areas would appear blue on the infrared machine, where cold air seeps in. He quickly sees why my son’s room has always been quirky—hotter in the summer and colder in the winter than the rest of the house. The back wall, against the garage attic, has no insulation. “Now we take the numbers off the machine,” Wes says, heading back down to the kitchen, to his computer and other diagnostic equipment. What this means is that Wes can’t recommend I do anything in my house—seal those leaking can lights or electrical outlets—without also adding ventilation. “Because the minute you start sealing up those things, you start to get sick home syndrome,” he explains. Wes analyzes the numbers gathered during the test. He does recommend that I seal the can lights over the master bedroom bed, and in my son’s room, since both my husband and son suffer from allergies. The best solution is to install a heat recovery ventilator (HRV) in the attic, which would add fresh air to all the upstairs bedrooms and the main floor rooms. Stale air would be removed and the house pressurized slightly so that it pushes back, so to speak, for dramatically lessened dust and insulation particles in the air. He estimates the cost at $4,000—money well spent for far healthier air and also for our home’s resale value. 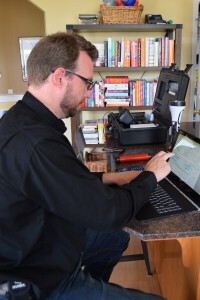 Understanding that such a project might not be in my family’s budget right away, Wes also suggests using standalone Daikin air purifiers in our master bedroom and our son’s room, at just a few hundred dollars per unit. Above all, Wes stresses the importance of not going into a home and sealing any leaks willy-nilly. Want to see Wes and Barron Heating in action? 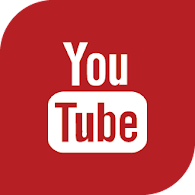 Watch several walkthroughs on their YouTube channel. Want to learn more about Wes? Just read the rave reviews he gets from customers. To schedule a Home Performance Assessment, call Barron Heating at 1-800-328-7774.